The challenge: Update their business development tools and implement an email marketing programme targeting existing and prospective customers. Result: A professional, appropriate suite of sales tools and an effective email marketing programme. Established in 1992, Pentos is a leading provider of technology products, services and solutions targeting small to medium sized corporate organisations. Authorised to the highest levels by the world’s leading IT manufacturers including HP, Lenovo, Microsoft and VMware. 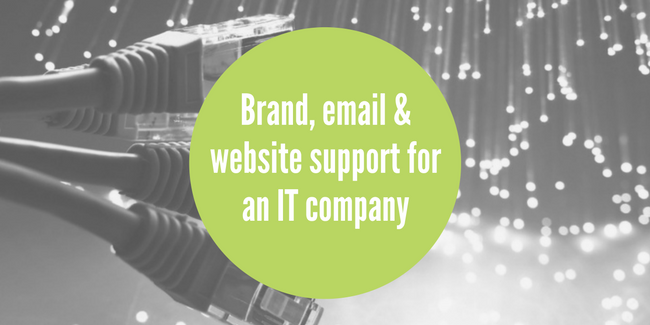 Specialising in Enterprise Wide Area Networking, Pentos excel in the provision of products and services including HP Blade Systems and Virtualisation products from VMware and Microsoft. To esure brand consistency and stakeholder buy-in across the business. Over the years the business development efforts had become fragmented and out of date with mixed sometimes conflicting messages. We undertook an audit of the existing marketing collateral and current communication strategy, as well an assessment their current and future requirements. This audit showed brand inconsistencies across marketing material, a lack of focus in targeting prospects and unclear marketing objectives. We recommended developing an up-to-date suite of sales support material including refreshing the website to reflect better the new marketing objectives which we helped set during a series of marketing planning sessions. Also, we suggested a email marketing plan. These recommendations were implemented over a 12 month period. During this time Evolve Marketing developed branded sales material including stationery, folder and branded template inserts, refreshed website and branded giveaways (mugs and USBs). We also created an annual email marketing plan that targeted three key sectors and then managed the creation and delivery of their monthly email update. Greater clarity of their offering among internal stakeholder and improved positioning of their offering to appeal to the targeted sectors. Their marketing collateral is up to date and professional with all their online and offline touchpoints aligned. As a result of the marketing planning and management they enjoyed increased sales.